"This is for every woman who has ever been in a relationship that was abusive, that hurt, that they shouldn't have stayed in"
A recently divorced Texas woman held a garage sale this weekend to get rid of everything that had to do with her unhappy marriage. "This is for every woman who has ever been in a relationship that was abusive, that hurt, that they shouldn't have stayed in, that they didn't know how to get out of," Briana Barksdale said. Barksdale's divorce was finalized January 31st but on Saturday she held a garage sale that she posted about on Craigslist titled "Divorce garage sale - Get him out of my life," adding that the divorce from her "worthless, cheating, abusive husband," took "two long years." She says her ex-husband cheated on her and was violent, and is now serving probation for assaulting a family member. 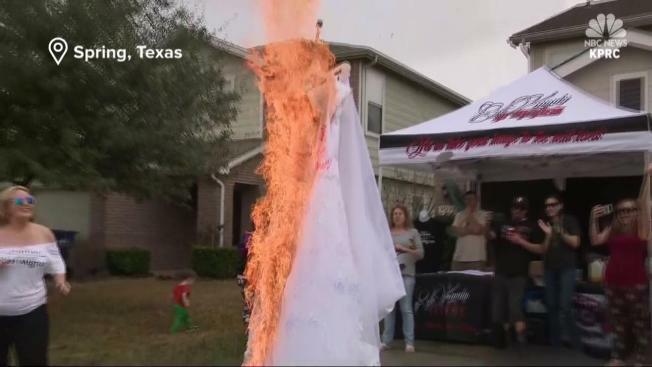 Before Barksdale burned her wedding dress, people came from all over to sign it, with some using more colorful language than the sharpies the messages were written with.